The flowers beginning to open. 1. Age. The plant has grown more since last year. In orchids shoots and pseudo-bulbs result in more flower spikes. 2. Fertilizer. Complete fertilizer was applied twice during the growing season. This orchid is responsive to fertilization both in terms of growth (shoots) and flowering (spikes). 3. Light. The plant has been placed in an area (south-facing) where it was getting sunlight as opposed to the previous year when (because of my lack of know-how) I kept the cymbidiums in the most shady part of the garden. 4. Orchid mix and Room to grow. The plant was transferred into a bigger pot with new and fresh orchid mix that I formulated. The formula seemed to work and the increased pot sizes probably increased root growth. 4. Differential temperature. This is the difference between the maximum (day) temperature and the minimum (night) temperature that the plant is exposed to. Flower initiation in cymbidium is mostly a function of differential temperature. Depending on variety or species, 10-20 degree-difference is required before flower initiation begins. The current southern-exposure location provided a longer time for the plant to be exposed to a sharper differential temperature. One reason why cymbidiums kept indoors do not bloom is that the growing temperatures are kept almost constant. 5. Visibility and Proximity. As they say, "out of sight out of mind", plants that are not seen often tend to be less cared for. The cymbidiums were moved into an area next to the back door where I could see them while doing the dishes. Seeing them reminds me more often to attend to their needs (water and fertilizer). Although the plant is tolerant to some degree of harsh growing conditions, it responds positively when environmental stresses are alleviated before they reach critical stage. Cymbidium is an outdoor orchid; for optimum flowering, treat it as an outdoor plant. Echeveria 'Black Prince' is a hybrid that resulted from crossing Echeveria shaviana (as the female parent) and Echeveria affinis (the male parent). E. shaviana has a dainty spreading appearance; the pinkish-grey leaves exhibiting a ruffled look. E. affinis, on the other hand, has very disciplined look with vertically inclined pointed black leaves. The 'Black Prince' cultivar got its appealing characteristics from these parents contrasting parents. This slow-growing succulent can be rapidly cloned by using the right vegetative part of the plant. I experimented using different leaves from the plant and I was amazed to see the sharp difference in the number of days to root. 1. Collect plant material. Collect leaves from the flower spike. It has been my personal observation that the leaves that are located right below the flowers are easier to root than the leaves coming from the base of the plant. It could be that the hormone that induced the plant to go into bolting (probably auxin) is abundant in this part of the plant. Auxin which is a growth regulator that is known to increase shoot and root growth. Leaves on the spikes are best for propagating. 2. Heal the cut. Allow the cut ends of the leaves to heal or develop a callus. This is done by wrapping them with a paper towel and keeping them protected and dry for three to seven days. Moistened paper towel provides regulated moisture. 3. Pre-root. Moisten a paper towel then fold it to fit into the bottom of a small plastic cup. Then arrange the leaves so that the healed ends are touching the damp paper towel. Cover with a plastic wrap and leave it alone for a week. (The leaves can be directly planted in small pots but I prefer to get the roots started first.) This is a good way to maintain the right amount of moisture for optimum rooting. Roots growing from the leaves of Echeveria 'Black Prince'. 4. Grow. Grow the pre-rooted leaves in a medium that provides needed nutrition for new plants Succulents generally prefer good-draining (high percentage of sand) potting mix. Make shallow holes in the adequately watered mix to minimize damage to the roots. Cover the rooted-end of the leaves with about a centimeter of the mix. Cover the rooted ends with a thin layer of potting mix (about 1 cm). 5. Cover with plastic. At this point your main adversary to success is too dry or too wet soil. Dry condition will be delay the growth of new plants while wet condition will induce rotting. To ensure high percentage of survival, securely cover the trays with plastic wrap. This will maintain the desired soil moisture during the critical time of rooting until the plant is established. Keep it in a place with adequate light (I keep them outdoors). New plants will become visible after two to three weeks. Clone your Echeveria today; and give them away as gifts. 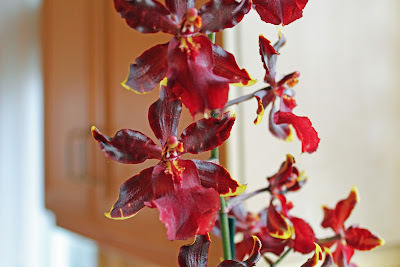 ﻿ ﻿﻿A friend of mine gave me an Oncidium orchid last Christmas. Although there are hundreds of species and hybrids under this category of orchids, the one I got is called Colmanara Wildcat 'Bobcat'. The plant came already blooming and more than a month later today, the flowers are still there. The glossy burgundy petals edged around the far end with a touch of gold (Fig. 1) continue to provide a colorful crown to the green leaves. This orchid is commonly seen in many stores in the country but I will introduce it here by featuring some of its attributes that are not so obvious to the eye. Hybridization material. 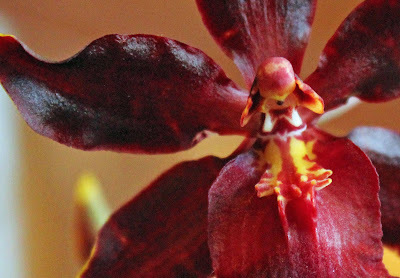 Oncidium is one of the most widely utilized orchids for hybridization. Hybridization is the process of combining desirable characteristics from two genetically different plants into one offspring-plant by way of cross pollination. For example, plant A may have beautiful flowers but blooms only once a year. On the other hand, Plant B may not be so beautiful but it blooms repeatedly during the year. Plant A and Plant B would then be crossed (through hybridization) to combine their desirable attributes (beauty and multiple blooming times) into one plant. That is hybridization in simple terms - but to come up with the ideal hybrid is a long process. Offspring from the same parents exhibit genetic diversity. Out of hundreds or thousands of seeds that result from one cross (Plant A x Plant B) it would be very fortunate to find just the right plant immediately. There are undesirable characteristics of each parent that get transmitted to the offspring, of course. Breeding is long process of cross pollination (of ideal parents) and selection (from resulting offspring) but when the right combination is reached, the reward is worth all the time and effort. Hybridization is achieved by controlled pollination. Most hybrids are interspecific (cross between two species from the same genus) or intervarietal (cross between two varieties/hybrids of the same species which may have resulted from earlier a crosses). In the case of the Colmanara Wildcat 'Bobcat', the plant is the offspring of two other hybrids of different genera (singular -genus): Odontonia (Miltonia x Odontoglossum) and Odontocidium (Oncidium x Odontoglossum). This makes the Colmanara Wildcat an intergeneric hybrid. Intergeneric hybrid is an uncommon type because it is developed by crossing two plants of different genera. To explain this let me use the example of a more common genus - Solanum. Solanum is a group of plants that are considered nightshade. Among the plants under this genus are tomatoes, eggplant, potatoes, etc. Intergeneric hybridization would involve crossing two different plants from this genus; eggplant x tomato or tomato x potato; it does not happen easily. So you get the idea; intergeneric hybridization is a challenging process. On the contrary, it is a common knowledge that interspecific hybridization is the easiest way to find compatibility in parent materials. Going back to orchids, the fact that intergeneric hybridization is possible or even common could reflect some degree of error in classification systems rather than a successful betrayal of genetic boundaries. It is for that reason that there is a wide variety of Oncidium intergeneric hybrids  in the market today. Pseudoantagonism. Most pollinators visit a flower in search of something that they desire such as food or even a mate. Plants on the other hand are often designed to attract their pollinators using scent, color and sometimes reward them with nectar. Some plants do not have anything to offer - so they rely on deceiving the pollinators; this is called deceptive pollination. Oncidium attracts its natural pollinator, the Centris bee, by simulating the apprearance of an enemy-insect. Natural pollination happens by way of pseudoantagonism. In this case the pollinator-bee is deceived into thinking that the flower (because of its shape) is a threat; it attacks the enemy in an attempt to defend its territory. When the bee strikes the enemy a.k.a. flower, the pollinia erupts and the pollens adhere to the attacker. The pollens get carried to the next flower during the next attack. If you use your imagination you can also recognize this insect-like structure on the column which is the center of the flower (Fig. 3). This is a unique and weird pollination mechanism but this is just one of the wonderful mysteries of plant life. The bracts that originate from the basal sides of the pseudobulbs are the ones that bear the spikes. Fig. 5 Bracts growing at the base of pseudobulb. 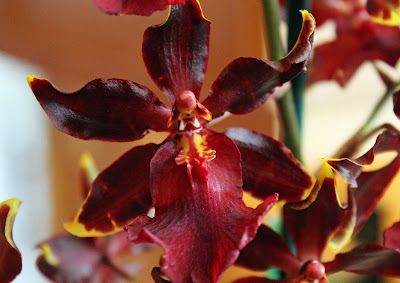 The next time you go to the store, try to see if you can identify the Oncidium from the rest of the orchids.